Colors: Solid black. some small amounts of white allowed on the chest and the tips of the back feet toes. 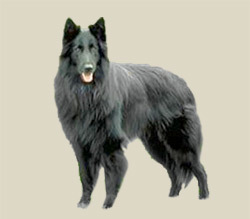 The elegant Groenendael is a muscular black dog, solid but not heavy, and very agile, with a proud carriage. The body is squarely proportioned. The triangular ears stand erect and the muzzle is long and tapering. The coat is very full, moderately long, with a ruff around the neck and extra feathering on the underside, legs and tail. There is a dense undercoat. The face and lower legs are covered with short hair. A little white on the chest, chin or toes is permitted in the standard. The long feathered tail reaches at least to the hocks. The brown eyes are almond shaped and the nose is black. The chest is neither broad nor narrow, but is deep, reaching to the elbow. The hindquarters are muscular, without looking heavy. The front legs are very straight and parallel to each other, with round cat-feet. Dewclaws may be removed from the front legs and should be removed from the back legs. The muzzle tapers, but is not excessively pointy. The skull is flat and parallel to the plain of the muzzle. The lips should be tight. The teeth should meet in a scissors or level bite. Ever watchful and on the move, the Belgian sheepdog glides in large circles. It is playful, alert, watchful and protective ? a tough, independent and intense dog. It is aloof with strangers and can be aggressive toward other dogs and animals. Some can be domineering. It is intelligent and biddable, but independent. It is protective of its home and family. The Belgian sheepdog needs a good deal of exercise, either a good long jog or a long, strenuous play session. It needs room to move during the day and does best with access to a yard. Although it can live outdoors in temperate to cool climates, it is family-oriented and happier if it can share time in the house with its family. Its double coat needs brushing and combing twice weekly, more when shedding.